Imagine living next to a well-maintained golf course on your residential campus. Automatically, the project gets the tag of super-posh, doesn’t it? This concept comes to fruition in the new project by Godrej Properties Ltd. called Godrej Golf Links Evoke. Located in Greater Noida, just 1 km from the nerve center of Pari Chowk, this property is part of an ambitious township by the builder. The heart of the development is a 9-hole golf course that is set to be a hotspot destination of the NCR. It is connected well via DND, FNG, Noida Expressway, Metro, and Yamuna Expressway. Then, the likes of Night Safari, International Airport, Cricket Stadium, Sports City, Expo Mart, and F1 Racing Track are transforming the area into an urban wonder. Godrej Evoke is the smart villa-based edition of the 100-acre township of Golf Links. It is a distinguished array of alluring abodes. 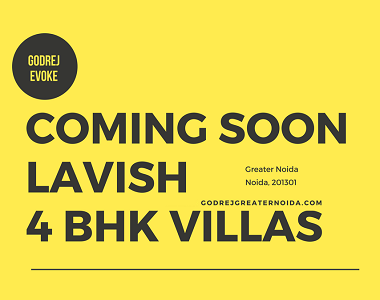 There are luxurious villas on the offer, with formats of 4 BHK being done in sizes ranging from 2359 sq. ft. to 4390 sq. ft. Each home is an expanse of vastness, and grandeur. The layouts maximise space and privacy. The finish is superb and lavish. There are natural and modern development zones in balance in Golf Links Evoke. The project boasts of an organic golf course. Also, there are 25 acres dedicated to dense green foliage. The villas have an enchanting view of the greens with panoramic golf views from most of the homes. Then, the other facilities include 4 mini clubhouses, many parks, and landscaped gardens, sit-out areas, walkways, water embellishments, and kids’ play areas. There are featured swimming pools, gym, indoor games areas, outdoor sports facilities, a golf academy operating in the campus, special security with dog guards trained along with skilled staff for maintenance as well. Owning a home in this property will move you to the highest levels of upscale society trending in NCR. Are you ready to make heads turn and hear gasps as you entertain your guests in true style?